After an expansion that lasted nearly a decade, the expansion that began in 2009 looks like it's finally hitting the wall. The stock market has run out of gas, interest rates are up, the bond curve has inverted, trade policy is anybody's guess, the left is ascendant politically, and the public and private debt is rising faster than it ever has. These problems almost sunk our economy during the financial crisis of 2008, but remarkably we were able to survive by blowing up bubbles in the stock, bond, and real-estate markets. But now all those problems are back, and they are even larger than they were before. We are running $1 trillion annual deficits, even when the economy is supposedly strong. The coming crisis will blow a hole in the federal budget and cause the Fed to unleash unprecedented quantities of monetary stimulus. The new round of stimulus will make a huge impact on investment performance. After a decade of a charmed existence, the US dollar will pay for a multitude of sins. 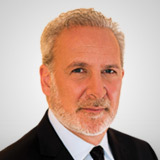 Famed author and investor Peter Schiff will explain in detail how investors can profit from the trends that may sink those who ignore the clear signs of change.